To immerse your taste buds in the countryside cuisine where you will find master cooks in traditional wears, celebrate the silence of the farms, interact with the English speaking locals, indulge in cultural fests, and pursue the beauty of the Tamil’s country life, enter into the hoods of these hospitable hamlets without hesitation in Tamilnadu. Located in the Trichy-Rameshwaram Highway, Karaikudi is the pivotal point of the surrounding hamlets bestowed with the effervescence of a beautiful lifestyle. “Chettinad” or “Vaisyas” or the merchant clan of Tamilnadu are referred to as “Chettiyars”. The architectural brilliance in their eco-friendly homes keeps the palatial mansions cool in summers too. The artistic pillars, Italian Marbles, Burmese Teakwood, Belgium Mirrors, and Spanish Floor, and Athangudi Tiles pose a classic sight. These mansions near Kanadukaathan render a bucolic feel. The heritage town of Tamilnadu venturing vast-ventilated mansions offers bountiful cuisine to dine too. The Chettinad chicken dish and associated superabundant gravy create a spicy aroma to the taste-thirsty tongue. Several niche mansions offer special cooking classes. On the other hand, regional cotton saris and fabrics are affordable picks. 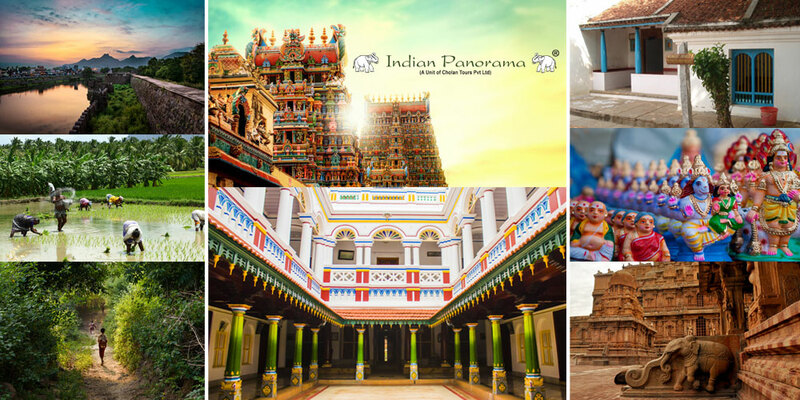 The famous Pillayarpatti temple at a distance of 12 km from Karaikudi, sepia-shaded photographs hanging on the murals and Thirumayam Fort built in the 17th century are the living cultural halcyon of the spice-scented village. Sites like “Ayiram Jannal Veedu” or “The House of 1000 Windows”, Periyaveedu in Aathangudi, Pallathur, Kothamangalam, and Devakottai villages within the 50 km radius of Karaikudi, and Chellapa Chettiyaar’s house in Kottiayur should be in your must-visit checklist. 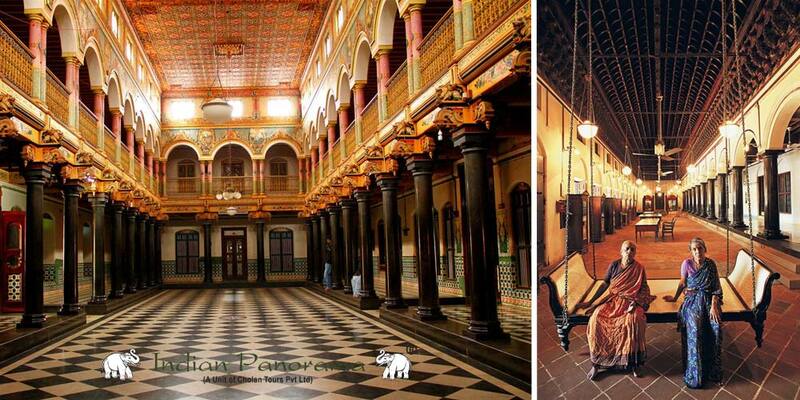 Look out for the huge keys and approach Sandhai (market) on Mondays and Thursdays for a wholesome Chettinad escapade. The capable administration of the Chola dynasty had made Tanjore’s irrigation system suitable for cultivation. The alluvial soils of the southern ingot with its numerous canals make vegetation look effortless. Cholas gifted the Brihadeeswarar Temple while Nayaks presented the Tanjore paintings. The deep roots of Barathanatyam, bygone music and oeuvre of art gift tourists an amalgamated culture. 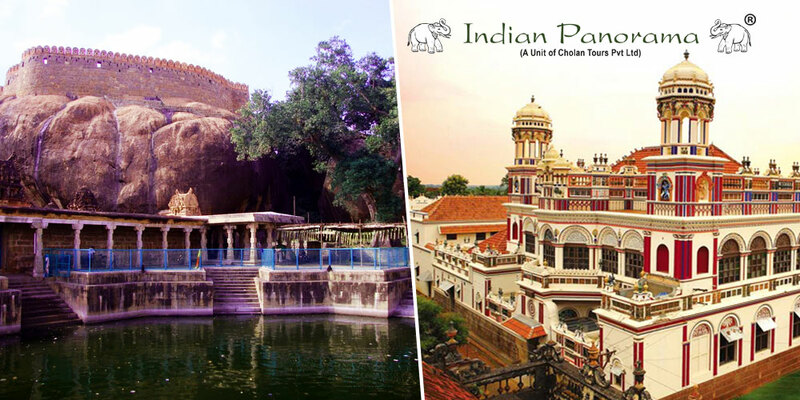 The “shadow mystery” surrounding the 1000-year-old Big temple, the unbelievable yet true daring tales of Raja Raja Cholan and Rajendra Cholan defeating kingdoms, their vast empire, cavalry units, thousands of war elephants, and utmost loyalty in administration bless the terra of Tanjore. Tidbit: The temple contains 130,000 tonnes of granite stones but there is no granite quarry within the 100 km circumference. Thanjavur, also known as the ‘Rice Bowl of India’, is located on the deltaic region of the Cauvery River. While agriculture is still holds a prominent place in the economy of this historical town, a visit to its countryside reveals much more The cultural renaissance of the Tamil family is best studied in Tanjore. 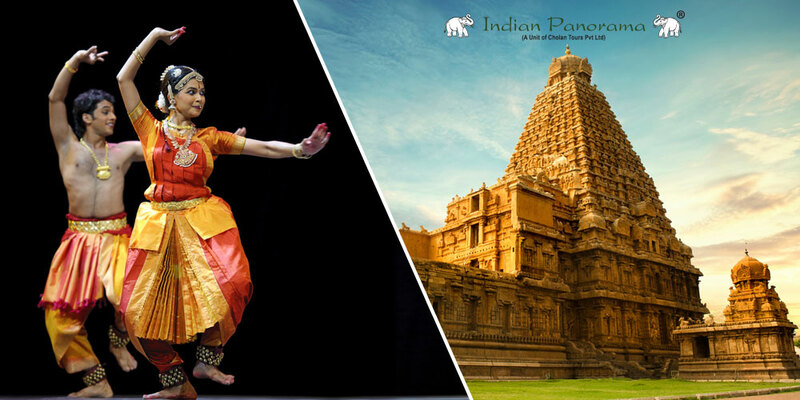 The contribution of Cholas in constructing temples, ports, dams, the germination of art, music, and dance had made the milieu conducive for growing crops, studying arts and literature, creating paints and clay dolls. The dawdling meadows, farmers with their cattle, “Agragarams” of Brahmins which are slowly replaced by our Muslim brothers, sludgy roads, handmade idols, and dolls, and bronze statues create euphoric waves one after another. 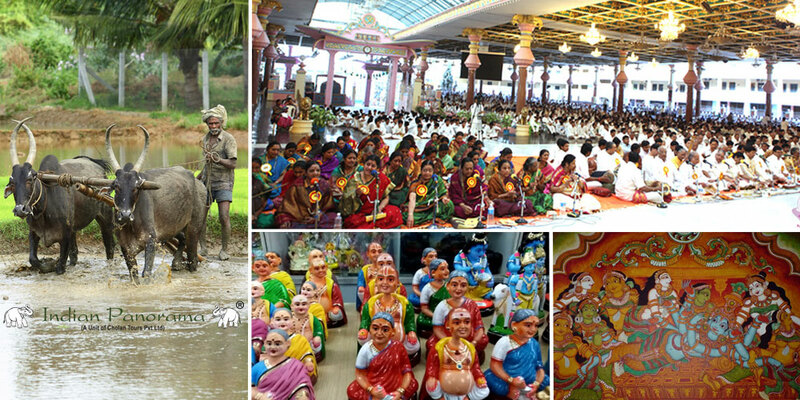 This must-visit rural town also connects “Thiruvaiyar” where “Thyagaraja Aradhana” is conducted. Get ready to witness the sensational Hindu mythology visiting the Murugan temple in this serene village. You can see the iconic statue of Lord Murugan explaining Lord Shiva about the meaning of “Aum” sitting on his papa’s shoulder. 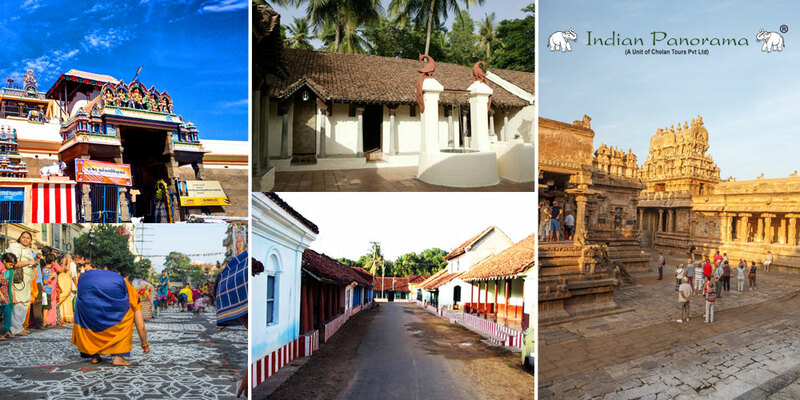 The town is full of ancient temples, greenery, deers, and is also near to the famous Brihadeeswarar temple. Women crafting magic in their “Rangolis” in the morning time, ancient bronze-making techniques, glittering rice fields, ruminating rivulets, and tranquil sunsets in the pristine milieu of Swamimalai give tourists an experience that needs to be penned immediately. Situated close to the holy town of Kumbakonam, traditional “Agraharam” style homes invite you with their threshold festooned with “Kolam”. As the epicenter of the forgotten wax-metal trade, it is retrieving an archaic tradition. Observe the complexity involved in creating embellished bronze statues. Meanwhile, adore the Darasuram temple built by the greatest rulers of India, Cholas. Saunter and organically explore one of the calmest hamlets in south India. From its cardamom estates to glaucous lakes, Athoor is buried heaven awaiting tourists to get lost in its charm. This plastic-free zone invites tourists and makes them become inhabitants of Athoor. Many foreigners have become permanent residents due to their love for the serene environment and salubrious weather. The perennial outstretch of the cozy climate have ample room for growing mangoes, bananas, coconut and palm trees. Athoor bagged the cleanest village of Dindigul district award from the Tamilnadu Government for its promising efforts towards cleanliness. Tidbit: The Sadayandi Cave Temple on “Aadi Amavasai”(The new moon of the Tamil month ‘Aadi’) attracts thousands of people for the Temple festival. More than 160 bird species invade this territory while 35 of them are rare gems. 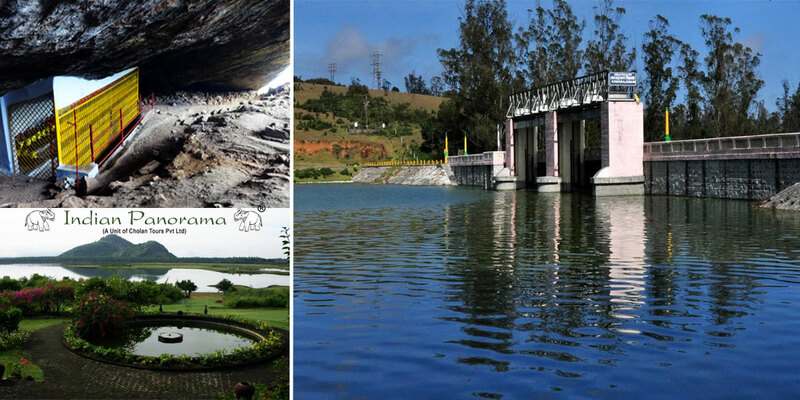 Swim in the monsoon supported water body of the Kamarajar Sagar dam and spot fishermen in coracles fishing in the lake. The tropical nature prevalent in this terra exhibit moody weather, suffice to traverse the Sadayandi Hill temple nearby this must-visited dam. The rustic mud roads take tourists to resorts while responsible tourism is a recommended activity after umpteen hours of deep rest. An overnight stay in the picturesque and viridescent wonderland of the Dindigul Taluk relaxes your soul with its tranquility nearby this must-visited dam. The rustic mud roads take tourists to resorts while responsible tourism is a recommended activity after umpteen hours of deep rest. An overnight stay in the picturesque and viridescent wonderland of the Dindigul Taluk relaxes your soul with its tranquility. The paper pulp along with a clandestine mixture of adorning ingredients came to India due to the efforts of the notorious conqueror, Taimur. The interest displayed towards art and architecture by an egregious emperor is often astonishing but the locals believe this conflicting tale. Also, the way one stomps the clay plays a vital role in the making of dolls, mythological characters, and innovative dolls. However, Vilachery is not just a pack of devoted artisans inventing different characters with mud but dedicated craftsmanship at its purest and rawest form. Tidbit: Some of the descendants of this village are from a Telugu speaking place. A five-inch paper-Mesh doll from Vilachery can have a place in your study as a symbol of respect to the creative art form. “Navarathri” and “Vinayagar Chaturthi” Kolu arrangements will have to count on the magical hands of the artisans present in this brave town. 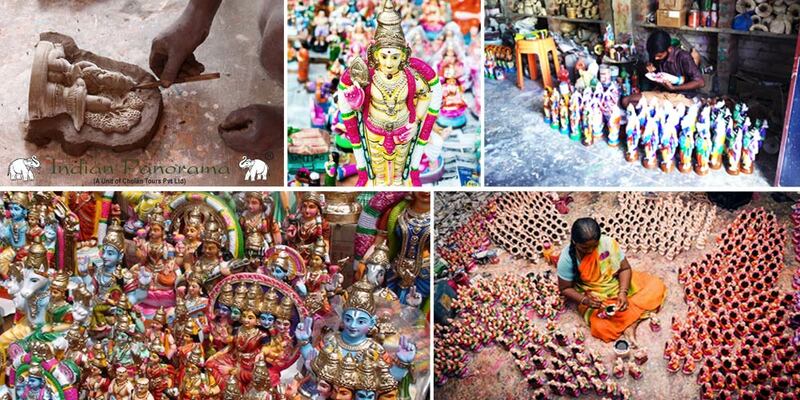 Imbibe in the cultural values, observe the doll-making process, popular beliefs and local legends. Try your luck in sculpting and bring smiles in the face of artisans for their veritable efforts to save an archaic tradition. 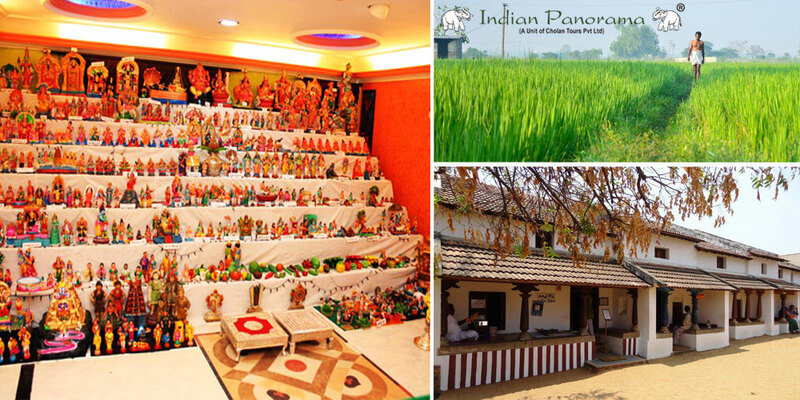 The vegetation happening in the meadows, perennial rivers, and valleys, the aroma of spicy foods, morning farm walks, evening chit-chats in the “Thinnai” (an extended place of a house built for wayfarers to rest), and a peaceful night under the open sky amidst the holy surroundings of Tamilnadu villages add happiness and life to your hectic schedules. Come and you will not want your holidays to end! Your customized family, couple, and solo trips are just a click away! 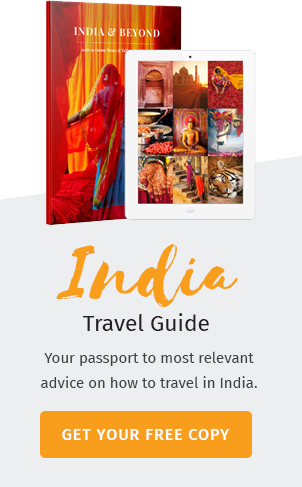 Reach us out anytime because we want you to explore our culture and heritage all the time and get to know the answers for the question “Why is India Incredible?”.